Einstein's General Theory of Relativity leads to two remarkable predictions: first, that the ultimate destiny of many massive stars is to undergo gravitational collapse and to disappear from view, leaving behind a 'black hole' in space; and secondly, that there will exist singularities in space-time itself. These singularities are places where space-time begins or ends, and the presently known laws of physics break down. They will occur inside black holes, and in the past are what might be construed as the beginning of the universe. To show how these predictions arise, the authors discuss the General Theory of Relativity in the large. Starting with a precise formulation of the theory and an account of the necessary background of differential geometry, the significance of space-time curvature is discussed and the global properties of a number of exact solutions of Einstein's field equations are examined. 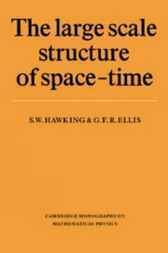 The theory of the causal structure of a general space-time is developed, and is used to study black holes and to prove a number of theorems establishing the inevitability of singualarities under certain conditions. These conditions are shown to be satisfied in the vicinity of stars of more than twice the solar mass near the endpoint of their nuclear evolution, and in a time-reversed sense for the universe as a whole. In the first case, the singularity in our past. A discussion of the Cauchy problem for General Relativity is also included in the book.